I needed something quick, and I didn't want to spend a lot for this particular window. We live near the beach so I wanted something coastal and this fit that need. It came in a timely manner, was neatly packaged and had all the hardware with printed instructions. My husband had it hung within about 30 minutes. The cordless lift is a bit "wonky", and I got a small sliver fiddling with it, but once I have it set I won't need to adjust it too much. It looks very beach-y and I'm happy about that. It looks exacly as pictured so I won't post one here. Good value for the price. 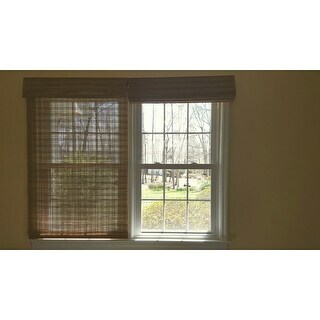 I have custom cellular shades on other windows in out home & for a window this size it would be about $300. Manage incoming sunlight and add a natural element to your surroundings with this Dali Tuscan Cordless Lift Bamboo Roman Shade. 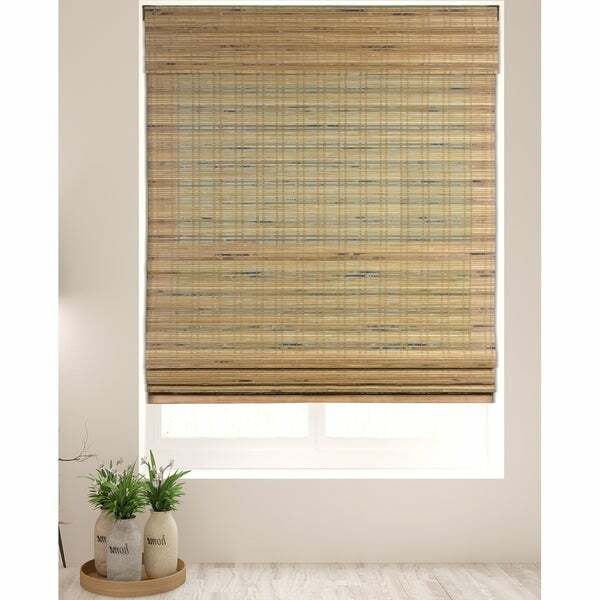 Available in multiple widths to conform to a variety of window sizes and constructed with sturdy bamboo, these light and airy shades add a subtle accent to your decor and provide just the right amount of shade on bright days. The cordless design of this shade allows for simple operation and an uncluttered look, and the versatile construction allows for both inside or outside mounting. 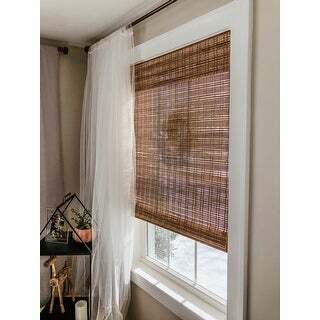 Install this shade over a kitchen window to soften the incoming breeze, or hang a pair in your bathroom to keep the sun out and create a Zen, spa-like atmosphere. 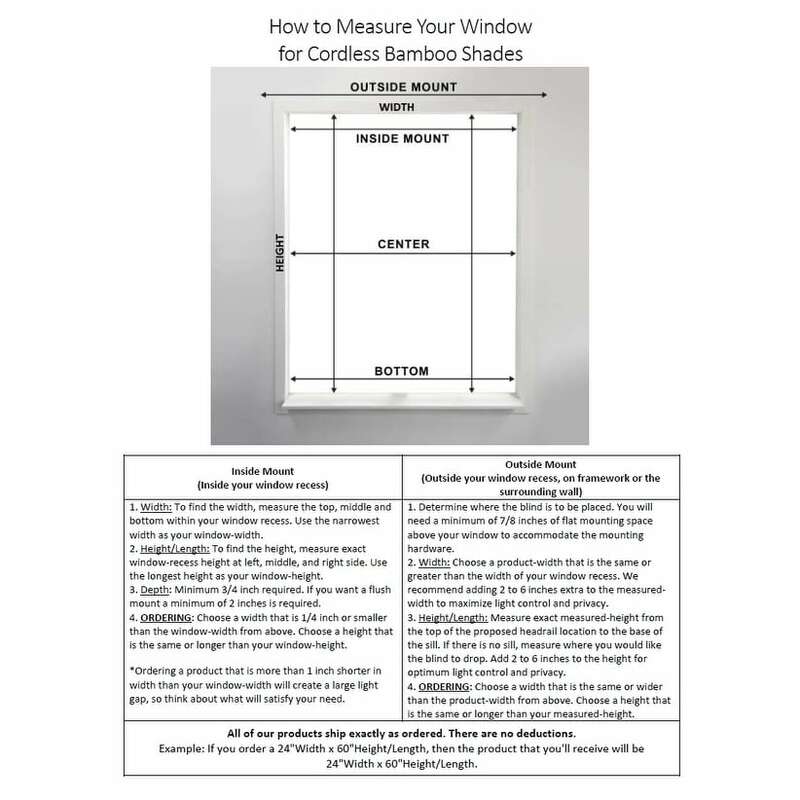 This bamboo shade is intended for indoor use only. Dimensions 2.0 In. X 41.0 In. X 60.0 In. These are great! 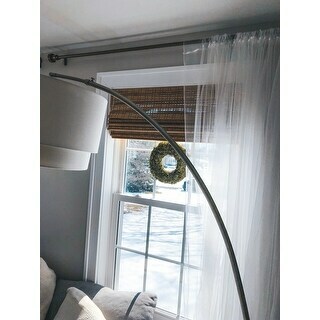 I love that they are cordless, and they are a breeze to hang. I had previously ordered a corded version of this from the same brand and those came shorter than the stated measurement. But these come exact to size. So if you order 24” they will be exactly that. Updating my review to say that we still love these shades! So much that we’ve since ordered another for our kitchen window. The ease of the cordless lift is something I never knew I needed but now I want to change out all of our corded shades to these. These shades are pretty cheap quality. Hard to pull up and down, very stiff and awkward looking. If you are ordering more than one, beware they are VERY different. I ordered three for large windows in my living room. One was a striped light and dark bamboo pattern, one was a medium brown consistent color with the top flat being striped light and dark, the other was a consistent different color brown with the top flat just having one very light colored stripe. Very noticeable, I ended up buying curtains to cover the side two....would not purchase these again, ever. 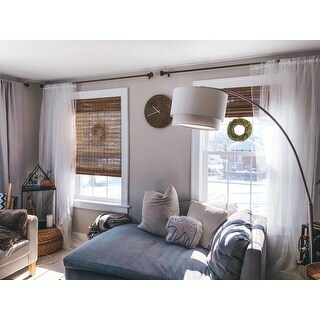 These shades are beautiful and cost effective! We bought these for our living room after seeing a similar model at another store for over $150 per window! You get what you pay for so the cordless mechanism is not flawless- it moves kind of sluggishly up and down and it can take some work to get it to stay level and look appropriately "bunched." For us, it's not too much of a problem since the shades stay up most of the time but it may be an issue for others. These shades provided the stylish look we wanted at a much better price point than competitors! Once again, so very happy with the purchase of my Arlo blinds. These four that I ordered were for the front of my house. It added a nice texture to the inside window treatments while still allowing some light through but also affording great privacy. The installation took about five minutes per window for an inside mount and the fit was perfect. All four of the blind colors matched, was worried with the natural wood that they might be off, not one bit! First time buying the cordless blind and I love them! Highly recommend!!!! Great shade. Beautiful warm wood shade and the perfect t accent to a white room. Just what we were looking for a sunroom in our countryside house! We were looking for something that light filtering, has privacy, and create a modern look. We ordered seven of these shades and they did the job! Look and function good; nice color and a considerable quality for the price. Will definitely recommend to buy these shades. Excellent product, easily put up. Allows one to see outside without allowing people outside to see in. The wider shades are very heavy so you need two hands to lift and lower evenly. Would have purchased several more cordless ones if they had them in a narrower AND shorter height product. Gives privacy and admits light. Exceptionally light weight (compared to the fabric Roman shade it replaced). Mechanism for holding shade in placed position works very well. Blinds are beautiful. They do allow some light to come in if they are down but not much at all. You can however see right through them, especially at night with the lights on. 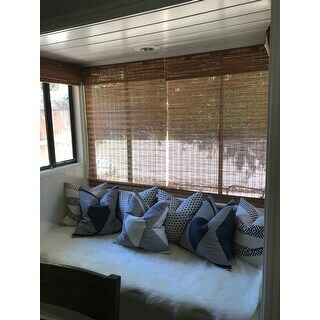 However, I bought them for the look and layered sheer panels on top for privacy. I did look into putting a privacy backing on them but I literally bought 18 so that wasn't going to happen. The blinds are nice no problem putting them up and for the price they should last a few years. These blinds are great. Love the color. Great price! 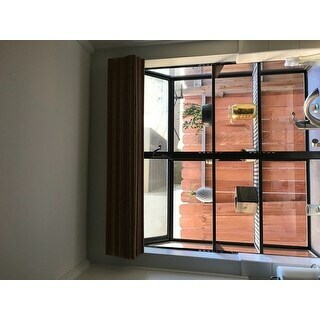 Great blinds and great price. I love the cordless design. So simple and smooth to operate. I love these blinds. I purchased 3 for my breakfast room and they are perfect For what I wanted. During the day I get some light filtering through them and I can raise them with one hand. Very good construction, good color and quality. Also easy assembly and no cords to contend with. Beautiful! I'm deducting one star for installation instructions that were unclear (it took us awhile to figure out that we were hanging the first blind backwards) and the fact that the push-up mechanism is a little balky. But I love the way these blinds diffuse the light so that the morning sun is not blacked out, but is not hitting us right in the eye either. I bought four, and the color is perfectly matched. I especially appreciate the 1/2" increments in width, so we could fit our windows perfectly. I can’t get enough of these blinds. I now have them in four rooms in different colors. They are well made, easy to install, work perfectly and look amazing. You won’t find them cheaper. These are amazing!!! They look beautiful! Better in real then on picture here. I love how they don’t have a string you pull on to close them but just automatically push up or down . I would def order again. 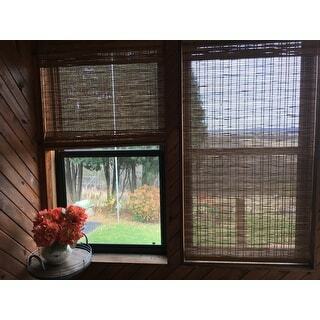 Love these blinds so much! Super easy to install in my son's nursery, am thinking about buying more for the rest of my house if the correct sizes are available. Highly recommend! "Any idea when the 31x60 will be back in stock? I have them for my kitchen and love them. Would love to add them to the rest of my downstaires"
Our prospective inventory range is beginning to mid march. We update our inventory regularly and would recommend checking back with us at this time. "I ordered 3 of these of couple weeks ago. They were 28 W x 60 L. I would like to order one more but I don’t see that option anymore. Where can I find this?" "For mounting inside my measurement is slightly over 36.5... should I order 37W or 36.5W? Thank you!" For all inside mounts we recommend a deduction of 0.25 inches to 0.5 inches to account for mounting brackets. Your best fit is a width of 36 inches. "Are these blinds treated with any flame retardants or other chemicals? What other materials (besides bamboo) do they consist of?" "can these be made shorter by taking some of the bottom off at home? " We do not recommend altering this product. If you do decide to make alterations we do recommend consulting a professional first as this will void any warranty or return policy on this product. Liked the color, fits our window dimensions.